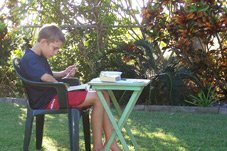 Our homeschool goal for our children (in educational terms) is for them to be life long learners, where they continue, regardless of their circumstances, to inquire and discover, to think wisdom (practical applications of knowing Jesus) and to encourage others to do the same. Discipline – our goal for our children is to be self-disciplined, to be governed by a desire for what is right, springing from their own heart. It is really important that we look at discipline from a relationship perspective when children are pre-teen to early teen and onwards. If we don’t have a heart to heart relationship with our children by this stage this needs to be our priority - no school work comes close to the importance of our relationship with our children and their inner heart. Ideas are the foundation of education. I want my children to be writing about ideas, not just retelling information they have gleaned. My children, older and younger constantly talk about what they read. With the older children our discussions head towards the principles behind situations or the character traits a person has displayed or not. These are ideas; these are the things that will build our children’s inner self. Narrations have moved from oral to written and from retell to original thought as the children get older. This is a gradual shift. I have taught my children that writing is just their words on paper so if it helps to talk it out first that is what we do before we go and write – regardless of what age. The writing assignments for my older students reflect this need for ideas, for wisdom as well as for knowledge. Talking is an important skill on its own (not just as a precursor to writing). We need to be able to express our thoughts to others in conversation. We need the skills of talking passionately without being overbearing. We need the skills to listen to other people’s passions. In our home we talk and talk and talk about things. To be honest, this aspect increases as the children get older! Reading living books – oh this has not changed!! When the children are confident, independent readers who can glean wisdom from what they read (not just knowledge) they take on their own reading list for learning. We do have reading aloud sessions in our home with our main effort being at dinner time – I read while the rest of the family eat dessert. I choose a book that hopefully the whole family will enjoy - the book isn’t chosen for educational purposes but for memory making. But the things we have learnt…! As these transitions happen I constantly revise where my children are at on the Development of an Independent Learner chart and make my decisions accordingly. This way we are truly working towards our goals. Janice Campbell has many resources to support homeschoolers through the highschool years at Everyday Education.